Uriel, Angel of Fire, whiffs a lot when you have a 247 armor class. As we come into the endgame in our current campaign, we’ve been trying to make sure everyone can show up for each session; this makes the sessions fewer, and so I end up playing Angband again. 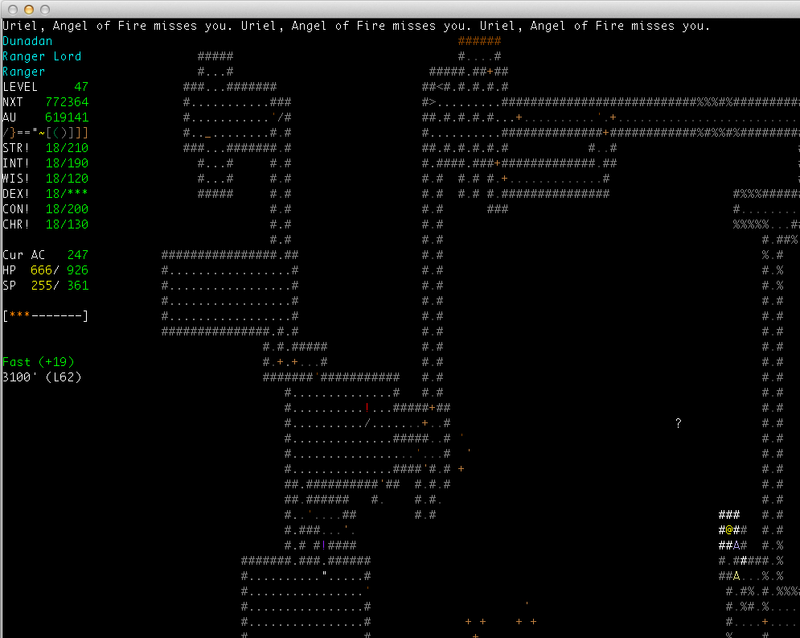 I’m not sure why, Angband/Moria is pretty much the opposite of tabletop role-playing. This level was filled with angels, and they all wanted to kill me. Beside Uriel (who was a bit of a pushover), Azrael, Angel of Death was also wandering this level and making a beeline for me whenever I got near him. Because I have no nether resistance yet3, Azrael does about 700 points damage in one turn. Since I only have 926 hit points and even with the Glaive of Pain it will take me several turns to kill Azrael, that is, as they say in economics, not sustainable. Fortunately I have telepathy (via the Iron Helm of Dor-Lomin) and Azrael blazes like a star telepathically, so it’s easy to avoid him. I’m the @ symbol. Uriel is the violet A. The yellow A is the archon who wimped out and called in Uriel to do his dirty work. It failed. The archon died soon after Uriel. Everything in Angband wants to kill you. Because angels are one of those things you wouldn’t normally think you want to kill even in a kill ’em all game, Angband’s descriptions of them even say something like, no idea why this angel wants to kill you, but boy, he’s pissed and you better fight back if you want to survive. Nether is sort of a death beam in Angband, and Azrael, as the angel of death, has it in spades. Uriel, Angel of Fire drops you to 666 hit points last modified March 8th, 2013.